Blockchain technology can be revolutionary. You know why? Because this technology can decentralizing anything, include financial market. This enabled many companies to create interesting investments and to generate excellent opportunities for you to profit. Besides prospective for the viability of economy, Blockchain also has the potential to completely change the entire economic activity. In recent times, blockchain has played an increasingly significant role in various spheres of our lives, including e-commerce business. The most advantageous feature of blockchain is that it can ensure trust in the Web without centralized management. Seeing this opportunity, a professional businessman named Sergey Ryabov plans to create a decentralized platform that can make e-commerce business more better by utilizing and implementing blockchain technology into its platform - Elementh. Elementh is a blockchain infrastructure designed for e-commerce market. The main goals of Elementh are to create a system that enables giving standardized name tag for products, guaranteed product ownership, product tracking, detection fake product, made simplify the entire process of buying and selling goods and services and make this process as transparent with low cost. Elementh will provides all participants of e-commerce market with real time historical data on stock inventory and price. This platform will also allows to create decentralized and centralized applications based on the Elementh blockchain. With this way, will enable the company to use blockchain technology to improve their businesses. 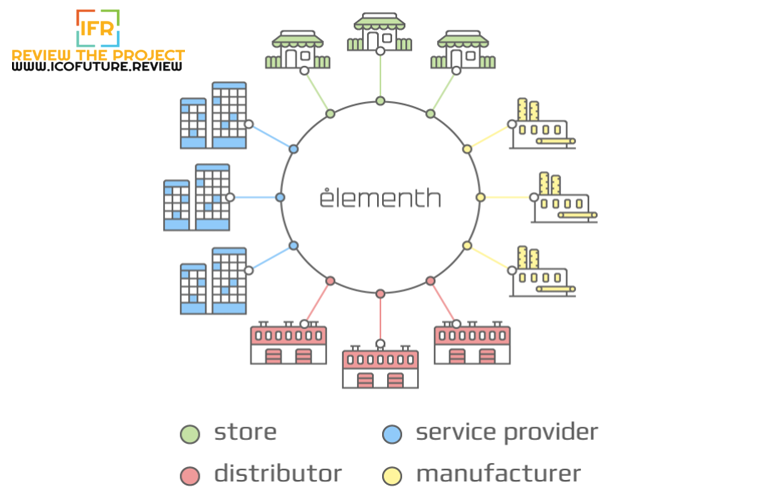 Elementh has created an infrastructure in which various people in the e-commerce markets, especially those from the B2B segment, can interact with each other. By creating a new standard of e-commerce that has significant advantages (market transparency and transaction cost reduction). The project is based on several systems providing the framework for the project's future structure. These systems guarantee robustness and operability of the entire platform. The whole structure implements chains of blocks based on needs and requirements. This solution will saves a lot of storage space and system resource costs. Besides that, the protocol owned by Element will allows the Elementh network to operate significantly more efficiently while maintaining a desirable level of security. Elementh platform will employs a custom made Smart Contract, that can enables to made digital ownership management (EOTS) based on authorization. While, to ensure that the Elementh blockchain operates quickly, they plan to implement it on DPoS protocol. It will provide the maximum speed of the block confirmation and reduce node loads. In general, there are two types of applications built on top of Elementh. The first category is financial applications that provide users with great opportunities to manage and participate in contracts using cash, including buying and selling products and online and offline content, as well as tokens built on the Elementh software. The second category is non-financial applications, such as identifying fake/counterfeit goods in the supply chain. For the convenience of use, a user-friendly interface between the Elementh basic layer and business abstract layer will be implemented. This abstract layer is located on the top of the entire system. It will provides a standard application process module for various businesses, and practical development modules. The business abstract layer will facilitates and accelerates the delivery and deployment to meet the needs of the final application development. The company will use the blockchain technology to organize the existence and register of the goods and to make sure that the users and the sellers will both work together. The customer will be able to pay using a smart contract and can easily have his money back if the product never arrives. Elementh can verify the originality of a certain good using the blockchain technology. Anyone would be able to verify it using the Etherum blockchain to confirm that the product comes from the manufacturer. You can also use this kind of technology to track the location and the movement of the goods. You will be also able to geolocate goods. You can also use it to discover fake goods. WHY YOU MUST USED ELEMENTH? The Elementh platform is multi-purpose and very convenient to use. For example, it is not necessary for any person developing the business abstract layer to have skills related to blockchain development. Ease of use can therefore persuade more developers and technical service providers to use Elementh as their main tool for creating applications for final customers in blockchain. It also allows somebody with little knowledge in the field to develop the tools for visualized smart contracts and to build connections with a smart contract by means of services for the needs of a relevant business. Even developers from different industries, or those with no blockchain experience, can deploy and develop a smart contract in order to push the application for the industry. Elementh will launch a utility token (EEE) based on Ethereum platform (ERC20) which will be integrated with smart contract. This token will be used for all operations in Elementh blockchain. To get access to the company’s necessary data, will be paid with EEE Token in the system. Service providers will pay the fee in the system and receive EEE Token in turn from companies requiring their service. Meanwhile, users can used EEE Token to pay the products or services offered by that company. Besides that, Users can also get rewarded in EEE Token for maintaining and developing the system, such as matching algorithm learning or product card creation, as well as detecting fake goods in the system.